Several months in advance, set a date. If important guests have unavoidable conflicts on or close to the actual anniversary, the couple may be willing to move the festivities to a different week or month if it allows everyone to be there. On the other hand, family members should make every effort to rearrange schedules for an occasion like this. Favorite restaurant. If it’s more than a small group, a reserved private room is best. Reserved shelter at a park. Look for one with adjacent parking and a restroom nearby. Hotel ballroom. If you have several guests coming in from out of town, ask about discounted room rates. Reminder: if your gathering includes alcohol, find a venue where that’s allowed, and if any of your guests use a wheelchair or have limited mobility, find a place that’s universally accessible. For a large party, send out formal invitations. Indicate whether children are welcome. Out-of-town guests may need invitations several months in advance. Most people will need prompting to remember to RSVP, so designate someone to badger people—er, follow up. If your shindig isn’t at a restaurant, you can either hire a caterer or enjoy home cooking. If you choose the latter, pick a theme and assign dishes so everything goes great together. Themed menu ideas include a casual barbecue, laid-back brunch, south-of-the border fiesta or a swanky cocktail hour. For many, the celebration won’t feel complete without a specially decorated cake. If you order one from a bakery, arrange to pick it up early in the day. That way, if something isn’t right with your order, there’s time to get it corrected. Pick a color scheme for the decorations. The couple may provide inspiration: You could choose the colors of the hockey team they love to cheer for, or go overboard with her favorite color. The season can also suggest a scheme: jewel tones in winter, for example, or lots of green in the spring. Black and white with an accent color, such as red, sets a striking backdrop. All white with gold accents is a classic combination for a 50th wedding anniversary. You can order or buy flowers or plants that complement your scheme. Here are some choices. Other decorative elements you might want to consider include: balloons, streamers, banners, tablecloths, paper plates/cups/napkins, candles and various framed photos of the couple from over the years. Don’t forget to decorate outdoors, too. Luminaria can line a walkway, clear white lights can twinkle in trees, or a big sign in the yard can let everyone know it’s a big day. Give younger kids sidewalk chalk to create hearts, and “happy anniversary” and “we love you” messages. And remember, you can rent just about anything, from table linens and silverware to speaker systems and extra chairs. The 50th is the “gold” anniversary. While yellow gold jewelry is the most traditional gift, some people choose white gold—or even rose gold, which is more unique. You can go easy on the environment by giving jewelry made from recycled gold. And you can go easy on your wallet by treating gold as the theme for your gift rather than as the material from which it has to be made—present your gift in gold wrapping paper or a gold gift bag, and adorn it with gold ribbon. Homemade and personalized gifts mean a lot. Specially made quilts can feature blocks with messages written in permanent fabric pens or photos on transfer paper. Items like etched champagne glasses or engraved photo frames can serve as lasting mementos of the occasion. If the couple enjoys traveling, group gifts toward a “second honeymoon” are a great idea. Give a gift card to an airline or hotel chain, or give a gift certificate to a B&B. Need more ideas? 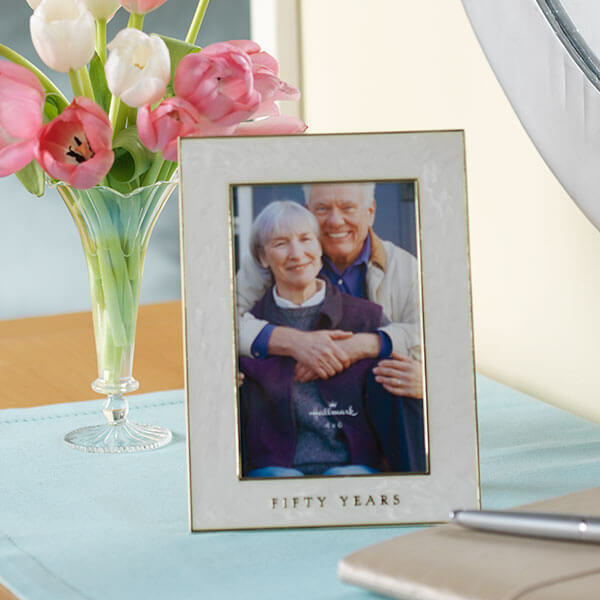 Get inspired with these creative 50th wedding anniversary gift ideas. At a large party, designate a table where people can leave gifts to be opened later, and include a basket for greeting cards. At a small family gathering, opening presents can be part of the fun. Arrange in advance for at least one person to deliver an anniversary toast. Be sure to have a nonalcoholic option for toasting, such as sparkling cider. A slideshow of photos of the couple over the years gives guests something to talk about and celebrates the history they share. Alternately, hang a photo collage in an entryway or on a wall. Buy a blank journal and write on the first page, “50 Wonderful Things About (Name) and (Name).” Number the pages from 1 to 50, and encourage guests to write in what they love about the couple. Make a playlist of songs that were popular the year the couple got married and/or of all the couple’s favorite songs from over the decades. For a large party, you can hire a string quartet or a pianist to set an elegant mood or a DJ to get guests dancing. There’s usually at least one shutterbug in every family. Tell him or her to snap away. An anniversary get-together also offers the perfect opportunity to get a group picture of the family. Choose the best pictures of the event and create a commemorative album to give later. Remember, no matter how carefully you plan an event, not everything will go exactly as expected, and that’s fine. That’s how marriage is, too—ask the couple if you don’t believe us! Once the party’s started, don’t sweat every little thing. Just enjoy the opportunity to be together with the people you love.